KSIS Training dates and times are now available for fall 2016. Instructor-led training is available for faculty, academic advisors, and staff at no charge. However, registration is required. Information Technology Services is pleased to announce the availability of an Adobe Enterprise License for K-State. Through the agreement, Adobe Creative Cloud and Adobe Acrobat Pro will be available to campus units for a fee. See the Adobe Licenses for K-State Units site to learn more. Named and device licensing is available. A named license would be associated with a faculty/staff member in a K-State unit. A device license is associated with each piece of hardware in a computing lab, etc. Units can request a named and/or device licenses submitting the Adobe License form. In conjunction with our Adobe Enterprise License, a work at home agreement also is available for faculty/staff for $9.75 per year. Students can also obtain Adobe products for $19.99 per month per year. See the Software Licenses site to learn about these options. For additional information about the Adobe Enterprise License, contact adobe@ksu.edu. Students are graduating and going on to new adventures. Use these tips to manage your K-State technology channels and resources. Students can now keep their K-State email accounts. Your eID must be kept active by meeting K-State’s password-change deadlines each semester. As part of the Teaching, Learning, and Technology Showcase scheduled in March, Adobe representatives will provide a complimentary training seminar the afternoon of Monday, March 12. This event has been moved to the day before the showcase in order to provide a larger timeslot for the Adobe presentations. Take this short survey to indicate Adobe topics you’re interested in. 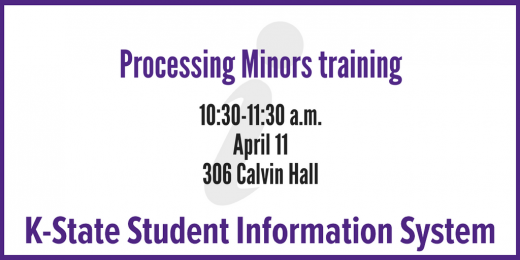 If you have any questions, email cathyr@ksu.edu. We invite all iPad users and those who are interested in seeing what iPads are all about to come and share at the next meeting, noon-1 p.m. Tuesday, June 14, in Bluemont 16A, focusing on photo-related apps. Bring your iPad questions and share your favorite apps! Q/A: Secure FTP software for Macs? Q. K-State’s central Unix system won’t let me log in via FTP to work on my departmental webpages. It says my Mac’s FTP connection isn’t secure. How do I fix that?